The brand new 7Pines Resort Ibiza is based on one of the most beautiful beaches on this exciting Balearic Island. 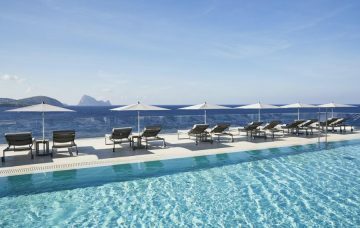 7Pines Resort Ibiza boasts stunning views of Es Vedrà Island in the distance, a year-round outdoor pool & spa. The brand new 7Pines Resort Ibiza is an exciting deluxe addition to Ibiza Holidays that will open its doors on the 1st May 2019. This luxury resort will be the perfect place to unwind in a calm and private setting; a seafront gem nestled amidst a pine forest and surrounded by azure waters, the cliff-top resort offers spectacular unobstructed views. 7Pines’ aim is to respect the unique culture and character of this very special location by integrating local Mediterranean elements into the property itself. A tailor-made offering and service: You define your luxury experience, we will guide you through it. One of the newest members of ‘The Leading Hotels of the World’ 7Pines Resort Ibiza will open its doors for the first time in summer 2018. Situated at the wonderful west coast of Ibiza, the resort localization is one of the most popular spots on the island with a spectacular view on Es Vedrà. The Seven Pines Resort Ibiza stands in a ground of authentic whitewashed Ibizenco homes which have been completely refurbished while respecting the original design and building methods. 7Pines Additional info: Facilities: 2 restaurants and 4 bars; 1500 m2 medical an wellness spa; 2 outdoor pools (including one infinity pool), outdoor jacuzzis, saunas and steam room: indoor and outdoor sport and fitness activities; hairstyling salon, nail- bar and professional make – up services; pershing yacht for guest transfers and charter; versatile meetings and banqueting facilities. Location info: Seafront all – suites resort nestled on a pine forest at the west coast of Ibiza on a cliff between the renowned Cala Conta and the secluded Cala Codolar while Es Vedrà and the azure waters of the Mediterranean Sea are set as its background. Our resort is located approximately 20 km from the airport. 7Pines Room info: The luxurious Ibizan village – style resort will offer 186 spacious one – and two – bedroom suites varying in size between 48 m2 and 119 m2, all of them have being created respecting the island’s authentic design with contemporary touches. The open plan suites enjoy views of either the gardens, lagoon – style pools or the Mediterranean Sea from private terraces and balconies. Homey ambience where the open room concept, expansive living room, private bar facilities and outdoor private areas provide you with the maximum comfort, space and privacy. Private Yachting – From day excursions to private dinners, our Seven Pines team can arrange for you to take to the azure waters in style. Private Jets – Our team can assist with arrival arrangements, ensuring easy travel and including booking private jet charters. Diving – The perfect diving spot: Ibiza’s crystal-clear waters and over 200 km of spectacular coastline. Clubbing – A clubbing Mecca, for those looking to join the party-goers and see their favourite DJ, Seven Pines can help anyone seeking a little hedonism arrange a stellar night out. Eating – Ibiza offers a diverse range of culinary delights from traditional dishes to sophisticated cuisine; Seven Pines can make recommendations to suit all tastes. Beaches – The perfect diving spot for both amateurs and professionals, Ibiza enjoys crystal-clear waters, over 200 km of spectacular coastline and extraordinary underwater topography. The Pershing Yacht Terrace provides the ultimate location for refreshment throughout the day or another superb sunset spot. Utterly unique, the Pershing Yacht Terrace is a sophisticated cocktail bar and the first in the world that has been designed by the Pershing Yacht team to emulate the vessels’ clean lines. It will enjoy views of the sea, an outdoor fire pit and glowing torches to set a chic yet low-key atmosphere accompanied by a chilled-out playlist. Home to signature drinks, classic cocktails and fine wines and liquours, it will be the perfect location for pre-dinner drinks or a night cap and perhaps a cigar. Open all day, the Lobby Bar is the ideal place to start the day with a speciality coffee prepared by our Barista and a homemade croissant while reading the newspaper. During the day, snacks and pastry items will be served to satisfy little cravings. Culinary delights will be offered at The View restaurant - open for breakfast and a la carte dinner to hotel guests and visitors - which looks out to the sparkling sea beyond. Its clifftop position and panoramic views, dedicated bread oven and extended breakfast hours (until noon) will ensure a relaxed start each morning. In the evening at The View, Chef Bijendra will create simple yet exciting European gastronomy using Korean cooking techniques such as steaming, fermentation and Robata grill to bring out the fresh produce’s exquisite flavours. The restaurant’s Chef’s Table - set around an open kitchen - will have its own special menu and allow close interaction with the chef. Both menus at The View will be accompanied by an extensive selection of fine wines from the resort’s specially-created and lovingly curated wine cellar. Ideal for relaxed wining and dining while enjoying Mediterranean sharing plates with Arabic and Asian influences, the laid-back Cone Club has a beach club feel and will be open from lunchtime till late. In addition to the 150 seats inside and outside on the covered terrace, guests will enjoy an open-air lounge with communal tables as well as separate cushioned and cabana seating. While enjoying smoothies, cocktails, chilled wine and cool beers, a light cliff-top breeze and stunning views, Cone Club is set to be a new sunset hotspot for the island that will continue beyond sun-downers to a chilled-out evening vibe. These one-bedroom (54-65 m²) and two-bedrooms suites (119 m²) are scattered around the resort’s gardens and represent the next level of space and discretion. Each suite features a private balcony or terrace with garden or sea view and forms part of a four-bedroom Ibizenco-style house. The two-bedroom suites feature a spacious living terrace and private pool that are ideal for private entertaining and families. Each house can be booked exclusively to offer more independence and tranquility. A 1,500 sqm oasis of pampering with a thermal circuit including 2 saunas, steam bath, cold mists and water beds. The Pure Seven Relax Tour will guide you through our saunas, steam bath, and indoor relaxing area to conclude with a visit to our captivating terrace where guests will enjoy a stunning backdrop of the island of Es Vedrà and the azure waters of the Mediterranean Sea in the most relaxing atmosphere. Meditation and yoga overlooking the sea whilst taking in the fresh ocean breeze will provide our guests with a total body and mind reset. The cliff-top is our studio and the Mediterranean is our playlist to which our guests will reenergize a perfect start to the day. The Hair & Beauty Salon at the Pure Seven spa offers a full range of cutting, colouring and styling services, as well as make-up, manicure and pedicure. Enjoy being pampered by our team of professional stylists.